A Pakistani father was arrested after he buried his newborn baby girl alive while her mother was still in the hospital. 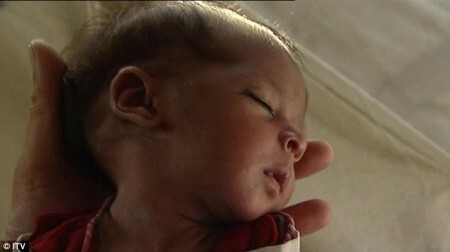 Pakistani police have arrested a man accused of burying his newborn daughter alive because she was physically deformed. Mohammed Anwar, a police officer in the city of Khanewal in the eastern Punjab province, said the child was born on Thursday at a hospital in the nearby town of Kacha Khuh. But after seeing his little girl, father Chand Khan is said to have been shocked that she had ‘abnormal features’. He then set about planning how to dispose of her body, it is claimed. According to police, he told relatives that the baby was born dead and arranged a funeral for the girl. But shockingly, the baby let out a cry during the service. Chand is then accused of burying the girl alive. Residents alerted authorities after seeing him take the baby to the graveyard. Khan, who has four other children, will be sentenced to death if he is found guilty of killing his daughter. Police say they will now exhume the child’s body to perform an autopsy. It is claimed that Khan’s wife was still at the hospital when the baby was buried.